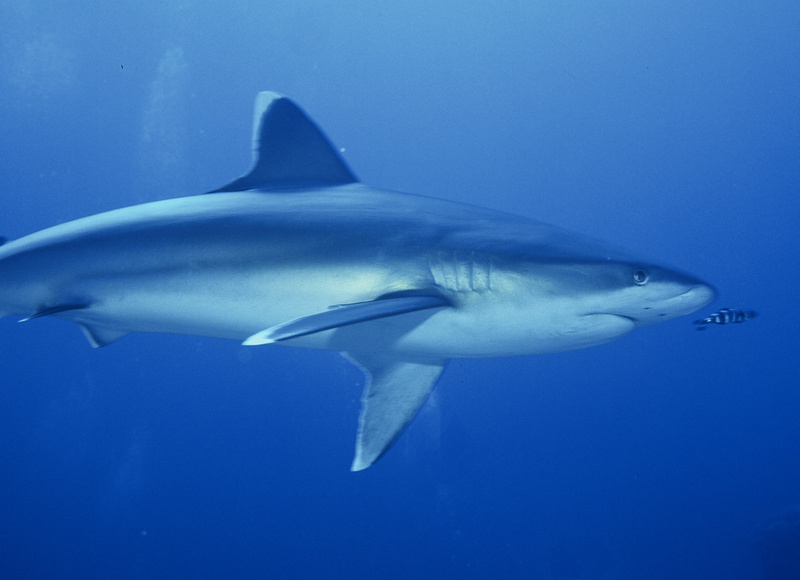 The Silvertip shark (Carcharhinus albimarginatus) is one of the rarer requiem sharks that can be encountered along the reefs walls of the Indo-Pacific. In the western Indian Ocean region, it can be found in the Red Sea and off East Africa including Madagascar, Seychelles, Aldabra Group, Mauritius, and the Chagos Archipelago. When a silvertip shows up, it means immediate supense. It is beautifully proportioned, and a swift and elegant predator. Like other requiem sharks, the silvertip is viviparous. It is recognized by the bright silvery tips of the dorsal and pectoral and the upper and lower lobes of is caudal fins. This makes it easy to distinguish from three other white tipped shark species; the white tip reef shark(Traenodon obesus), the grey reef shark (Carcharhinus amblyrhynchos) and Oceanic white tip (Carcharhinus longimanus). Its behavior however does show some resemblance to that of the Oceanic, since the silvertip can also be inquisitive and bold, especially in the presence of food. Unfortunately, in the northern Red Sea the silvertip has become an infrequent visitor. In the southern Red Sea it may turn up above sandy plateaus of more remote islands, often at places that are frequented by a more common species of requiem shark, the grey reef shark. The favorite spots visited by the greys are steep promontories or ‘points’ where masses of schooling fish and larger predators patrol in the strong currents. During our visits of Saganeb reef in the Sudan the greys were regular customers along the famous South-West point of the atoll. Here we must have been the very first divers that started to bait the sharks with mall pieces of tuna, often hidden under a coral head or tied to a rock. Grey reef sharks are not considered as dangerous to divers and much less bold than the Silver tip or Oceanic sharks. Still, in a shark frenzy even the greys can become fierce, fast moving and darting around. Usually a sign for the diver to stay out of the turmoil. Occasionally scalloped hammerheads (Sphyrna lewini) may show up at the SW point of Sanganeb. But they prefer the deeper and darker layers of water where they congregate in schools, swimming against the current with their bodies occasionally reflecting the sunshine from above. My first (and only) encounter with the silvertips were not at Sanganeb but at Shab Rumi, another atoll about 20 miles north of Sanganeb (see insert). Shab Rumi became famous because of Jacques-Yves Cousteau's experimental underwater village Precontinent II, which is still a major underwater hotspot of Sudan. Some remnants of this project, like two shark cages covered with soft corals and the mushroom shaped docking station of under water scooters, are still there. The beauty and richness of the Sudanese reefs makes a trip to these remote locations a must for Red Sea adepts. A live aboard leaving from from Marsa Alam in south Egypt, would probably need a night of sailing from Rocky island to cross the Sudanese border and reach these reefs.